Now The Details: Public Broadcasting: the agony and the ecstasy! Public Broadcasting: the agony and the ecstasy! 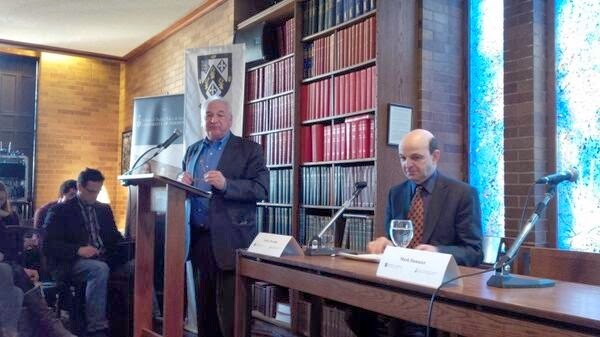 At a well attended conference held at Massey College, University of Toronto yesterday, I was asked to be the moderator/provocateur for a panel on the future of public broadcasting as part of the 2014 Walter Gordon Symposium. Panelists included Trina McQueen, former head of CBC English TV News as well as first CEO of Discovery Canada and then CEO at CTV. Tina was, for a time, my boss when I worked at CBC TV's "The National." Also there was Mark Damazer, now head of St. Peter's College Oxford. Previously Mark held a number of prestigious positions at the BBC including head of news and Controller for Radios Four and Seven. In anticipation of this discussion, I wrote this op-ed piece on a strategy that I think the CBC might usefully explore. I thought it was provocative. But it was hard to "out-provoke" when the statements by the panelists were so usefully provocative on their own. Trina, who spent some time as a member of the Board of the CBC was wonderfully forthright in condemning the CBC for squandering its reputation as one of the great news services of the world. The CBC, she said has been plain wrong in moving budgets and resources away from news and drama, plopping them into frothy, so-called "reality" entertainment programs. She was, in a word, magnificent in her defence of CBC's best traditions of news and current affairs. Mark Damazer was also very strong and candid about the BBC's managerial gaffes (for which he took some of the heat) over lapses in news judgment. He was also very clear about the culture of self-loathing that exists inside the Beeb. "A jolly good thrashing" was how he described the way the BBC reports on itself whenever errors great and small are revealed. This contrasts starkly with how the CBC has responded tepidly to revelations that some senior journalists have been pocketing speaking fees from groups that have an interest in how they are covered by CBC News. (The CBC Ombudsman, to her credit, has condemned the practice and a policy review is now underway). All of us agreed that the essential question for public broadcasting is who are you going to trust? The public in all three countries want to believe that public broadcasting operates on their behalf. And operating at variance from the best of their core values is always fraught. In the end, its not the comedies or the digital fluff that sustains, but a deep commitment to reliable and contextual information that has meaning for the public. Could it be any more simple and yet more elusive?